Power plants produce electrical energy for consumers to use, whether at home or for business, that’s obvious enough, but did you know that in order to produce that electrical energy they must first be supplied with heat energy? The heat energy that power plants crave comes from a fuel source, such as coal, oil, or natural gas, by way of a burning process. Once the heat energy is released from the coal through burning, it’s transported into a steam turbine by way of superheated steam, which is supplied to it by a piece of equipment named, appropriately enough, a superheater. So what is a superheater and how does it function? Take a look at the illustration below. The superheater looks like a W. It’s actually a cascading array of bent steam pipe, situated above a source of open flames which are produced by the burning of a fuel source. A photo of an actual superheater is shown below. So how many bends are in a superheater? Enough to fill the needs of the particular power plant it is supplying energy to. Since all power plants are designed differently, we’ll keep things in general terms. The many bends in the superheater’s pipes form a circuitous path for steam to flow as it follows a path from the boiler to the steam turbine. 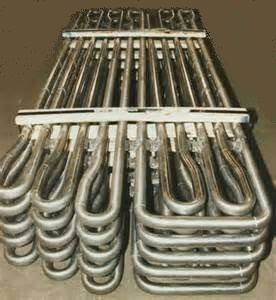 The superheater’s unique construction gives the steam flowing through it maximum exposure to heat. In other words, the bends increase the time it takes for the steam to flow through the superheater. The more bends that are present, the longer the steam will be exposed to the flame’s heat energy, and the longer that exposure, the more heat energy that is absorbed by the steam. Superheating routinely results in temperatures in excess of 1000°F. This superheated steam is laden with abundant heat energy which will keep the steam turbine spinning and the generator operating. The net result is millions of watts of electrical power. As we learned in a previous blog, the superheater is designed to provide the turbine with sensible heat energy to prevent steam from completely desuperheating, which would result in dangerous condensation inside the turbine. The newly added superheater is a major improvement to a power plant’s water-to-steam cycle, but there’s still plenty of waste and inefficiency in the system, which we’ll discuss next week. Did you know that water droplets traveling at high velocity can take on the force of bullets? It can happen, particularly within steam turbines at a power plant during the process of condensation, where steam transforms back into water. The last couple of weeks in this blog series we’ve been talking about the steam and water cycle within electric utility power plants, how heat energy is added to water during the boiling process, and how turbines run on the sensible heat energy that lies within the superheated steam vapor supplied by boilers and superheaters. We learned that without a superheater there is a very real possibility that the steam’s temperature can fall to mere boiling point. When steam returns to boiling point temperature an undesirable situation is created. The steam begins to condense into water within the turbine. To understand how this happens, let’s return to our graph from last week. It illustrates the situation when there’s no superheater present in the power plant’s steam cycle. After consuming all the sensible heat energy in phase C in Figure 1, the only heat energy which remains available to the turbine is the latent heat energy in phase B. If you recall from past blog articles, latent heat energy is the energy added to the boiler water to initiate the building of steam. As the turbine consumes this final source of heat energy, the steam begins a process of condensation while it flows through the turbine. You can think of condensing as a process that is opposite to boiling. During condensation, steam changes back into water as latent heat energy is consumed by the turbine. When the condensing process is in progress, the temperature in phase B remains at boiling point, but instead of pure steam flowing through the turbine, the steam will now include water droplets, a dangerous mixture. 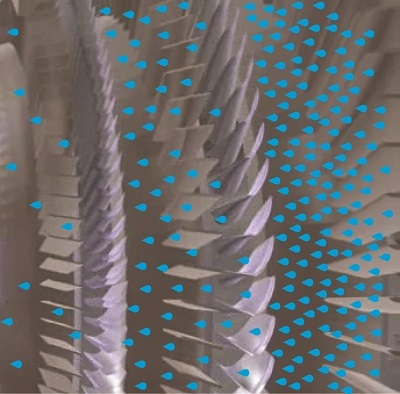 As steam flows through the progressive chambers of turbine blades, more of its latent heat energy is consumed and increasingly more steam turns back into water as the number of water droplets increases. The danger comes in when you consider that the steam/water droplet mixture is flying through the turbine at hundreds of miles per hour. At these high speeds water droplets take on the force of machine gun bullets. That’s because they act more like a solid than a liquid due to their incompressible state. In other words, under great pressure and at high speed water droplets don’t just harmlessly splash around. They hit hard and cause damage to rapidly spinning turbine blades. Without a working turbine, the generator will grind to a halt. So how do we supply the energy hungry turbine with the energy contained within high temperature superheated steam in sufficient quantities to keep things going? We’ll talk more about the superheater, its function and construction, next week. Last time we learned that the addition of a superheater to the electric utility power plant steam cycle provides a ready supply of high temperature steam, laden with heat energy, to the turbine, which in turn powers the generator. But this isn’t its only job. One of the superheater’s most important functions is to regulate the ongoing process of desuperheating that takes place as the turbine consumes heat energy. To understand this, let’s see what takes place if the superheater were to be removed from its position between the boiler and turbine. 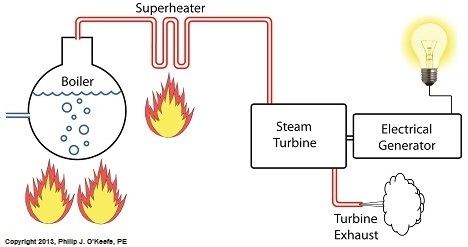 Without the superheater, the only available remaining source of sensible heat energy to the turbine would come from the meager amount present in phase C steam as shown in Figure 1. If you’ll recall from a past blog, the sensible heat energy contained in superheated steam is the best source of energy for a steam turbine, because it’s able to keep it operating most efficiently. 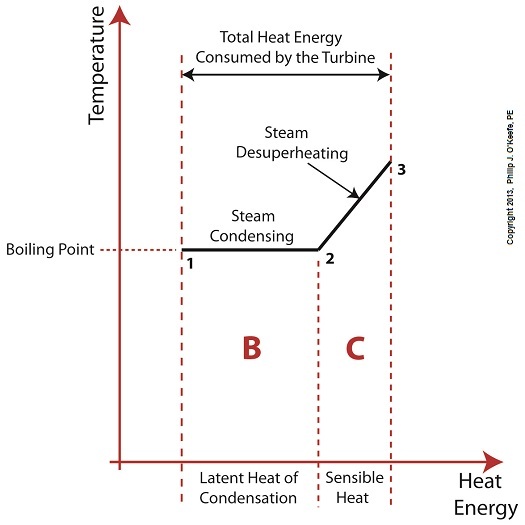 As the turbine consumes the heat energy in phase C, starting at point 3 and continuing to point 2, the steam it’s consuming is in the process of desuperheating, as evidenced by the downward slope between the two points. Desuperheating is an engineering term which means that as sensible heat energy is removed from the steam due to its use by the turbine, there will be a resulting drop in steam temperature. And if this process were to continue without the compensatory function provided by the addition of a superheater to the steam cycle, the steam’s temperature would eventually return to mere boiling point, at point 2. This is an undesirable thing. With the steam’s temperature at boiling point, the only remaining source of heat energy to the turbine is the latent heat energy of phase B. This heat energy will lead to an undesirable circumstance for the operation of our power hungry turbine as we will see next week.